Enter in your mobile phone number or e-mail address and we will notify you when CityNav Au NZ Maps Navteq is back in stock. These pre-loaded cards are made and updated every few weeks to ensure they are up to date with the latest map revisions. When ordering any Mapping products from Johnny Appleseed GPS, please specify your GPS model in the "Special Instructions" field at the checkout screen, so we can ensure it is compatible. City Navigator Australia & New Zealand provides detailed road maps and points of interest for your Garmin device, so you can navigate turn by turn to the destination of your choice. 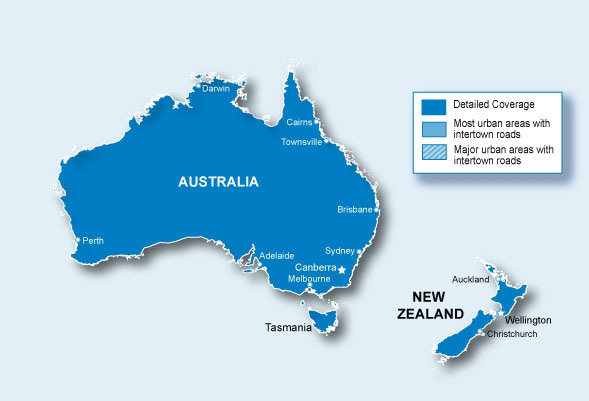 This map is provided on microSD card (with SD sleve) so just plug it into your compatible Garmin GPS and you're ready to navigate Australia and New Zealand! Coverage includes all of Australia & New Zealand, including the Lane Cove Tunnel and the M7 Highway in Sydney, the East Link freeway and the Pakenham bypass in Melbourne, the Tugun bypass at Tweed Heads, and the Albury/Wodonga bypass at Alburys. City Navigator brings you the most detailed street maps available so you can navigate with exact, turn-by-turn directions to any address. You can also route to Points Of Interest such as restaurants, petrol stations, lodging, attractions and more. Also includes detailed information such as turn restrictions, speed categories, roundabout guidance and other navigation features. The latest version includes improved address range support, speed limit details for most major metropolitan areas in Australia, additional speed camera locations and additional Junction Views and 3D landmarks on your compatible unit. Includes detailed maps for all of Australia & New Zealand. Have uploaded it, but not used it on the road yet. However, tried to update my UK/European maps online - took forever - and then use it in the UK but it didn't work properly. Something must have changed as the original worked fine. Pros: Up to date at time of first use. Not as useful as the CD I used to get. I don't think I will be buying any more garmin products. Previously I could install the updates on my computer and use them for planing and updating my GPS's. Doesn't happen now. 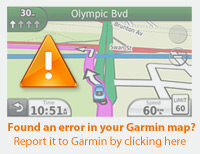 Hi Lyell, if you're using Garmin's latest PC software (BaseCamp) then the mapping on the card you purchased can be viewed on your computer whilst the card is inserted. Hope this helps. Pros: Arrived in next mail. Easy installation in Garmin Edge 1030 (or 1000). Cons: Cost. Was a little hard to be sure I was ordering the correct sim for my unit as there was no compatibility guide on the website specific for the software. I used the Garmin Zumo unit on a 70,000 KM ride from Alaska to Argentina. The system is so good that when I imported the bike back to Australia I wanted to keep the Zumo. It was so simple to swap the Micro SD from the American to the Aussie maps, and I certainly appreciated zero internet requirements. These maps combined with the Zumo are truely fantastic. Being from North America, and able go get LTM updates for less than half the cost does seem strange. I do understand the limited market. And from reading Johnny Appleseed spec. They do updates weekly. As a Garmin map it does all the thing's you expect.